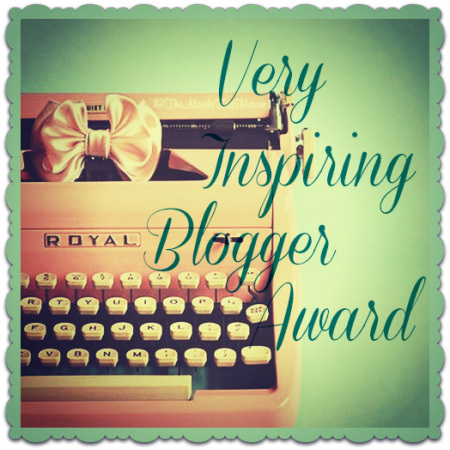 This is the last in a series of posts that discusses everyday practical needs that almost no one ever talks about in providing care and making life easier for both us as caregivers and the loved ones with dementias and Alzheimer’s Disease that we care for. In the first post in this series, we discussed how to make things easier day-to-day for our loved ones in the areas of eating and incontinence. In the second post in this series, we discussed day-to-day helps in the areas of personal grooming and bathing in the journey through dementias and Alzheimer’s Disease with our loved ones. In this post, we’re going to discuss the other day-to-day areas where we can make care easier for ourselves and our loved ones in the journey through dementias and Alzheimer’s Disease. The first area we’ll look it is how to effectively and safely address limited mobility and problematic mobility issues that arise both as a result of the progression of these degenerative neurological diseases and the aging process itself. Because dementias and Alzheimer’s Disease affect the parts of the brain that control movement and balance, even our loved ones with no other health-related mobility limitations will eventually develop a shuffling gait and maintaining their balance when standing or walking will be difficult, increasing their risk of falls and injuries. Our loved ones will also have a much harder time getting up and down from a seated position. One of the most noticeable difficulties will be getting up from and sitting down on the toilet. Many occupational therapists will recommend, as part of the home adaptive accessory purchases, buying a bedside commode for use when our loved ones are sick and unable to easily get to the bathroom or when – especially toward the end of life – if our loved ones aren’t completely immobile, walking any distance is too difficult. A bedside commode will cost between $30-$40 out-of-pocket and can be purchased at a local medical supply store. However, with home health care or palliative health care, this will be covered by insurance (Medicare or other insurance) as part of the home health care or palliative health care services and equipment. Occupational therapists will also recommend using the chair portion of the bedside commode over the bathroom toilet in the interim to facility easy standing and sitting. 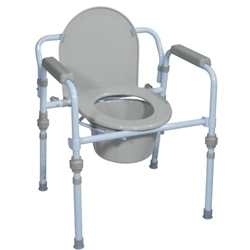 The bedside commode chair is wide, and often won’t fit well, especially in smaller bathrooms, and securely enough over the toilet for this application. Additionally, the distance between it and the toilet (even with the open guard that comes with most of them) makes keeping the toilet area clean and sanitary more difficult. So I recommend, instead, a raised toilet seat with arms. A raised toilet seat will cost around $60 out-of-pocket and can be purchased at a local medical supply store. However, with home health care or palliative health care, this may also be covered by insurance (Medicare or other insurance) as part of the home health care or palliative health care services and equipment. The advantage of a raised toilet seat with arms is that it attaches to the toilet, is more secure when standing and sitting, and is more comfortable than the bedside commode chair. It is also more sanitary and easier to keep clean. Installation is quick and easy. 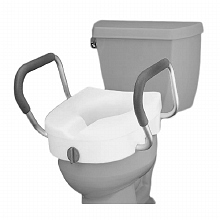 With the toilet seat up, the raised toilet seat is placed directly on the bowl of the toilet where it attaches securely with a large plastic bolt to the inside of the bowl. As our loved ones progress in their journeys through dementias and Alzheimer’s Disease, they will become more sedentary than active. This will mean sitting for long periods of time. Motor skills become more muted with neurological degeneration and a lot of the automatic sensory information that the brain gets, processes, and responds to will disappear. Therefore, it will become less automatic for our loved ones with dementias and Alzheimer’s Disease to feel the natural discomfort of sitting in one position or sitting still for a long period of time that, when we’re neurologically healthy, causes us to automatically move and shift weight frequently when we’re seated. This results in the increased likelihood of pressure sores and pressure ulcers developing. Once the skin breaks down in this manner, treatment and healing are difficult at best. Because of this, infection and sepsis often follow leading to death. The most effective way to prevent pressure sores and pressure ulcers from sitting for long periods of time is to buy padding for the chair that distributes weight more evenly and that does the work of ensuring that automatic shifting of weight occurs. 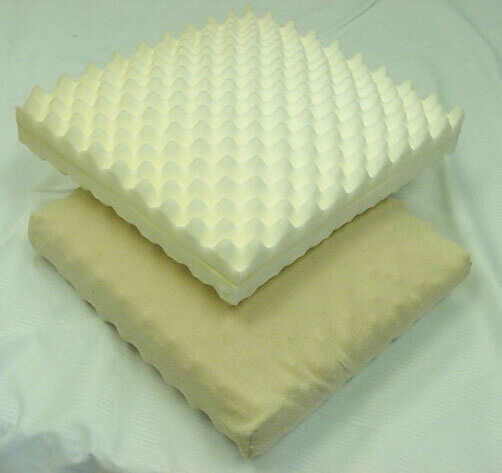 The least expensive way (about $20) to do this is to put a thick (at least 4″) egg-crate-type foam pad (most come with a plastic covering to help with incontinence issues) in the chair that our loved ones with dementias and Alzheimer’s Disease spend most of their seated time in. These can be purchased at most big-box retail stores. Another physiological change that occurs for our loved ones as dementias and Alzheimer’s Disease progress is difficulty swallowing (known as dysphagia). This difficulty includes liquids and solid foods, as well as medication. Dysphagia presents two real dangers to our loved ones. One is choking. The other is aspirating food into the lungs, which can lead to the development of pneumonia. In fact, it is more common than not that pneumonia is the cause of death for our loved ones with dementias and Alzheimer’s Disease. That’s how serious swallowing issues are for our loved ones. However, we can help mitigate this risk by some very simple techniques that will facilitate easier swallowing and reduce the risks of choking and aspirating food into the lungs. Let’s start with taking medication since this is usually where swallowing issues appear first in the journey through these neurological diseases. However, before I discuss the technique that usually is helpful for our loved ones to more easily swallow medications, it is important to discuss the medications themselves and the form they are administered in. 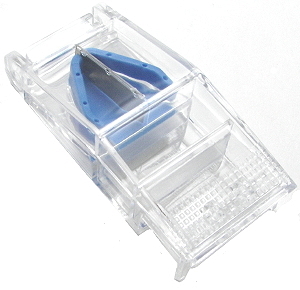 First, as caregivers, we should all have a pill cutter (also known as a pill splitter) as part of pharmacy stash. These can be pick up at any pharmacy very inexpensively. This will come in handy when managing medications with varying dosages (such as diuretics or glucocorticoids like prednisone, which might be increased temporarily or gradually and then decreased the same way). However, I strongly advise against a pill crusher and crushing any medications (although assisted living facilities and nursing homes routinely ignore this when administering medications to residents with dysphagia). The reason is because there are medications that when crushed can cause serious side effects and become completely non-therapeutic. 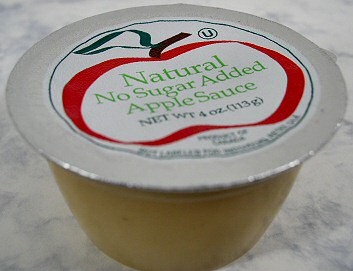 When our loved ones with dementias and Alzheimer’s Disease begin to have problems swallowing medications with water or juice, the easiest and usually-most-effective way to help them be able to swallow the medication is to use applesauce (I recommend unsweetened). Put the pill on about 2/3 teaspoon of applesauce, which goes down the throat more easily, and swallowing should be much easier. If our loved ones have medication that come in a large pill form (potassium supplements are a good example and because they tend to dissolve in the mouth and are very bitter are not a good candidate for cutting in half), we should have our loved ones’ primary care providers (PCPs) prescribe a different form of the medication. Some medications are available in a liquid form (potassium, for example, comes in a liquid form and can be mixed with applesauce). Other medications are available in a sprinkle form (for example, Depakote, which is often used for mood balance in Lewy Body dementia because of the high sensitivity to anti-psychotics like SeroquelXR, is available in sprinkle form and can be mixed with food). If a liquid or sprinkle form of the medication is not available, then we should work with the PCP to change to a smaller-pill alternative that will produce equivalent results. As swallowing becomes even more difficult for our loved ones, liquids and solid food may need to be altered as well. Sometimes this can be as simple as cutting up food (meat, for example, can be very hard to chew thoroughly in large pieces) into very small pieces and modifying or eliminating foods. Easy foods to modify are vegetables. Raw vegetables and salads become difficult to chew and swallow for our loved ones as they reach this stage of dementias and Alzheimer’s Disease. Easy alternatives to ensure good nutrition are cooked beans and finely chopped vegetables, including some of the lettuces we normally use for raw salads (avoid kale and mustard greens – I use these for raw salads – because even cooked, they can be difficult to swallow). You can also use these cooked beans and vegetables to make a creamy pureed soup. 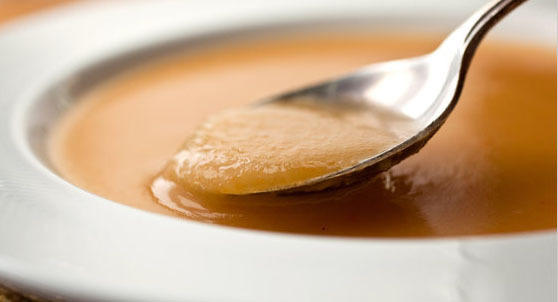 The key is to make the soup so that it approximates the texture of applesauce (not too thick and not too thin). And I will pass this modification on as a personal note – if you want my recipe, email me at goinggentleintothatgoodnight@gmail.com – for cornbread. Crumbly, grainy, and textured breads and crackers are eliminated from our loved ones’ diets when swallowing everything becomes problematic. The reason is that they can choke and aspirate the little grains and crumbs into their lungs. But my mama loved cornbread and I wanted to see if I could find a way to keep it in her diet. I had been doing some reading on healthy substitutions in baking (for oil, for sugar) prior to this ever being an issue, so I decided to try one of the healthy substitutions for oil – yogurt – in a batch of cornbread to see if it would change the texture from grainy to smooth. It worked perfectly (beautiful texture) and we were able to keep that in Mama’s diet (and any time we can find a way to do this, please go for it and try it!). Swallowing issues may advance to the point where the dysphagia diet levels need to be implemented. There are three levels in this diet, depending on badly swallowing is compromised. I have not personally used these, although I’m familiar with them. However, this is something that a speech therapist with home health care or palliative health care is qualified to and can help and guide us through at this juncture with our loved ones with dementias and Alzheimer’s Disease. 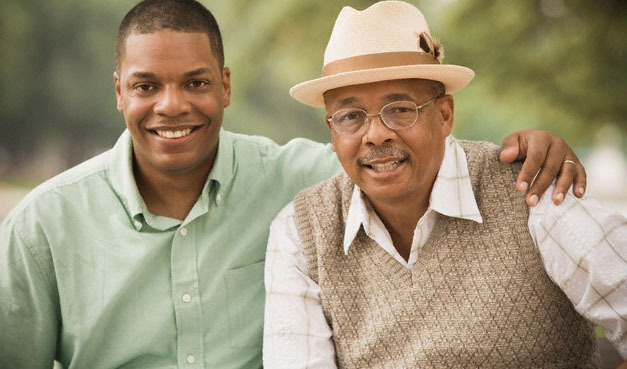 I can’t emphasize enough how important it is for us as caregivers to have one or other of home health care or palliative health care on board as we provide care for our loved ones since they have resources, like speech therapists, who are available to walk us step-by-step through each phase or issue that we may encountered. This is the last post in this series. If there are other day-to-day “in-the-moment” things related to caregiving for our loved ones with dementias and Alzheimer’s Disease that would make your life – and, no doubt, many others’ – easier that you would like to see discussed, leave a comment here and I’ll work with you to get you the answers and the help you need. And please don’t forget to share this on social media. Dementias are more prevalent than ever – and will only increase from this point on – and more and more people are in the role of caregiving for their loved ones. Even if you don’t know all the people in your online networks, by sharing this information with them, you may be giving a lifeline to someone who is struggling, feeling overwhelmed, and completely alone on their journey. We never know whose lives are crossing the path with ours. And this may be a random act of kindness that you’ll never even know you did. All you have to do it hit the Share buttons (and there is an email button for those who may not be on social media) for the social media forums you’re on to pass this information along to whoever may need it and can use it.